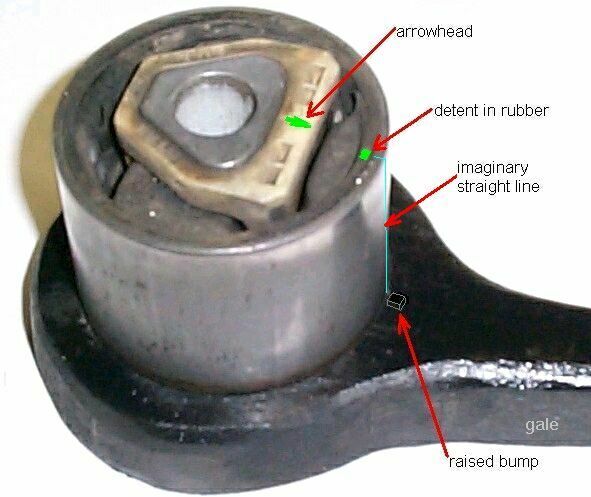 It takes about 125 to 150 ft-lbs to drive the old bushing out and about 100 to 125 ft-lbs to drive the new bushing in. The Grade-8 bolt is good for approx. 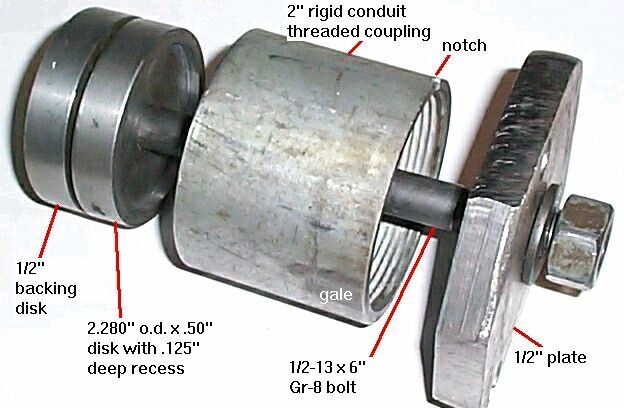 220 ft-lb, so using it to press the bushing out is within a safe range, unless the old bushings are corroded, in which case it would be best to use an hydraulic press. Polyurethane bushings are also available from BMP, Bav Auto, Ebay, & numerous other suppliers listed in the Roundel. Here is a view from the left side of the car showing various components. 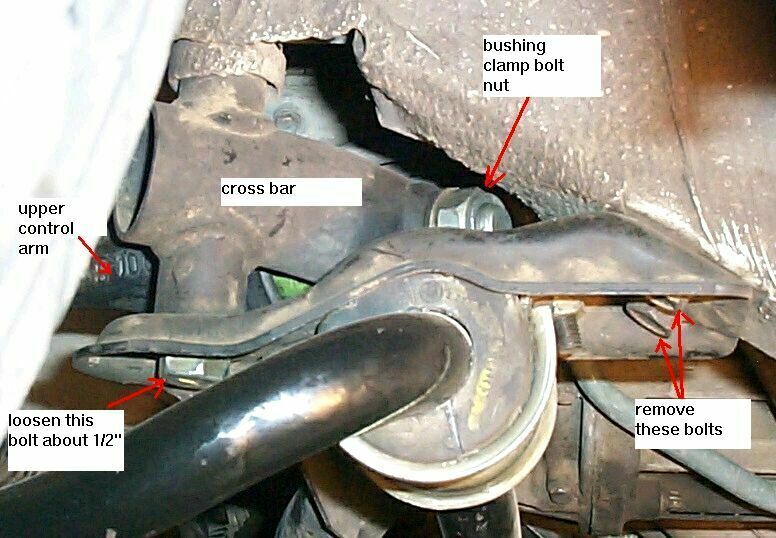 In order to get access to the nut on the back side of the bushing clamp bolt, I loosened the cross member bolt on each side, & removed the two bolts at the rear of the sway bar brackets. This lets the bracket drop down enough to get an end wrench on the nut. 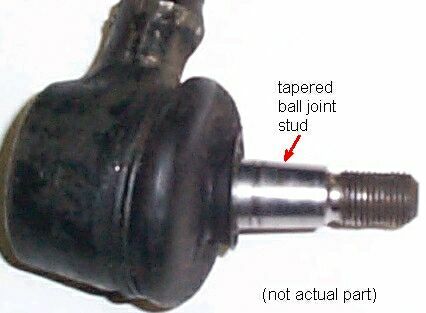 On the right side, there is a heat shield in the way of the control arm bushing. It prys out of the way to get access to the bolt. 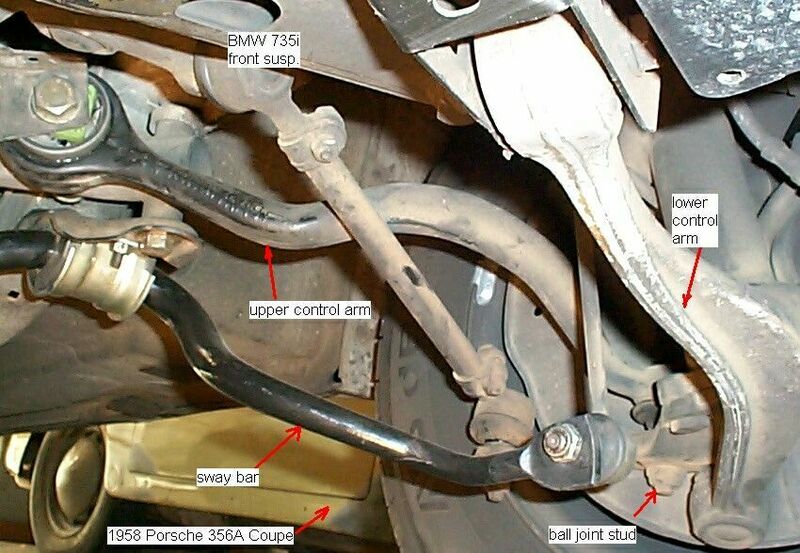 With the bolt removed, the control arm will drop down enough to work on the bushing. Here's some more views from the inside, underneath the car. 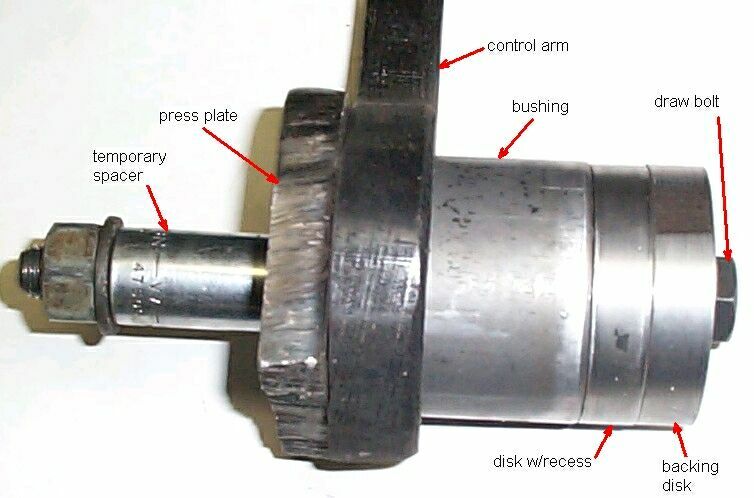 You may find it easier to remove the arm entirely by removing the ball joint end, in which case, it would be better to press the old bushing out & the new one in with a hydraulic press instead of a make-shift fixture. Most machine shops should be able to do it for a small fee & many automotive repair & parts places (NAPA, etc.) are set up to do it. 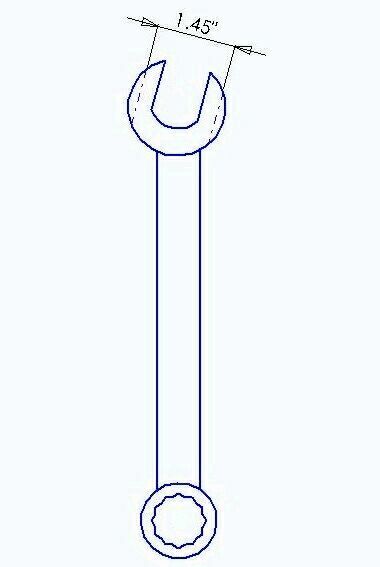 When installing the new bushing, line up the witness marks as shown. The back side of the control arm eye is faced orthogonal to the bore centerline so I inserted the new bushing from the front & pulled it from the back so it would go in square with out cocking at an angle. I heated the end of the control arm with a propane torch to approx. 250F to 300F to expand it slightly for both removing & installing the new bushing and put a few drops of 30W motor oil on the inside bore surface so the new bushing would slide in more easily. Due to limited draw bolt length, I left the sleeve off when starting the bushing until it was pressed about 1/2" into the arm end. Once the bushing was partially inserted, I removed the bolt & added the outer sleeve fixture to pull it thru the rest of the way. 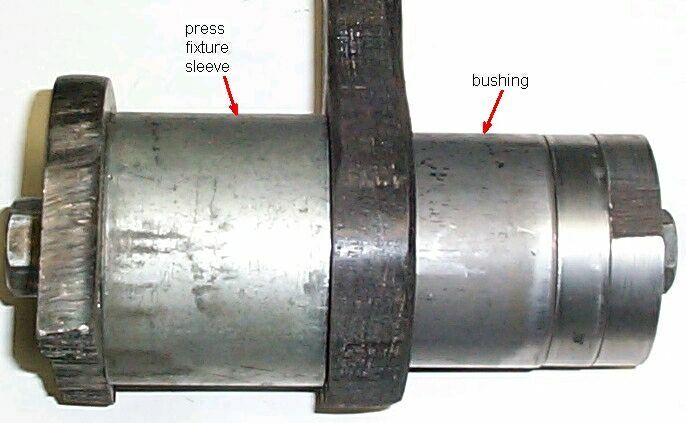 Ideally, the bushing ends should protrude the same amount on either side of the arm end. I ended up pressing one in too far so reversed the fixture to press it back the other way until it was centered, hence the notch in the sleeve to clear the raised bump witness mark on the control arm. As usual, re-assembly is the reverse from above. Note: The front wheels should be fully weighted before doing the final tightening of the bushing bolt when re-assembling. I had mine mostly put back together and then lowered the front wheels onto a pair of 4x6's layed flatwise & had enough room to crawl underneath & do the final tightening. If upgrading to polyurethane bushings, it is not necessary to have the wheels loaded for final tightening. 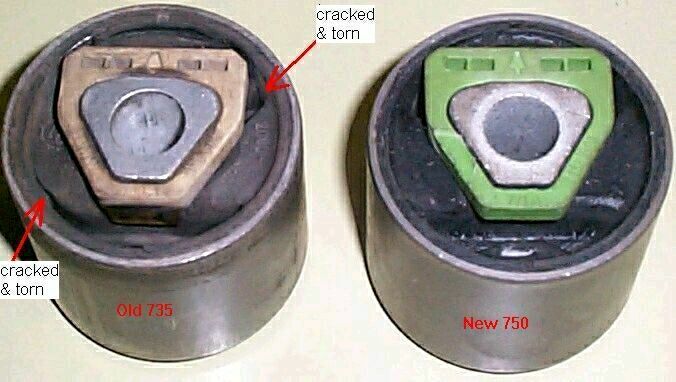 Polyurethane bushings may require periodic greasing of the inner sleeve to prevent squeeks. 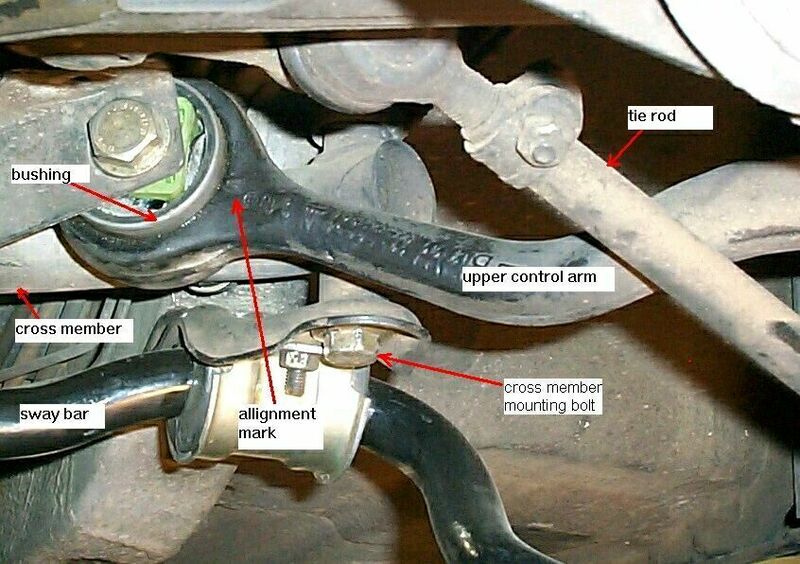 Lower control arm bushings are available separatly, but if the lower arms are alumium, the bushings are not replacable.